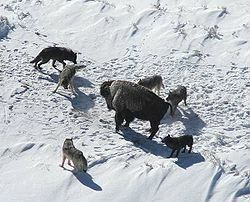 Canine packs often work together, as in this bison hunt. Pack is the name given to canines, which live and hunt together. That means the dog tribe, known as the Canini. It does not apply to foxes (the tribe Vulpini). Other caniforms (Caniformia) live singly or come together at mating times, with some exceptions (like the badger). So, not all canids form packs. If they do, the size of the pack, and the social behaviour in the pack varies by species. The animals in the pack know each other. Always there is a hierarchy of dominance inside the pack. The classic case is the grey wolf. All packs are united by genetic relationship: they are family members. One reason why some mammalian predators evolved group behaviour is that their prey lives in massive herds on grassland. The most notable predators on grassland are the wolves and jackals (caniforms) and the lions and hyaenas (feliforms). The same principle works with aquatic predators: if their prey goes in shoals or family groups, then the predators go in groups. This page was last changed on 14 August 2014, at 15:00.